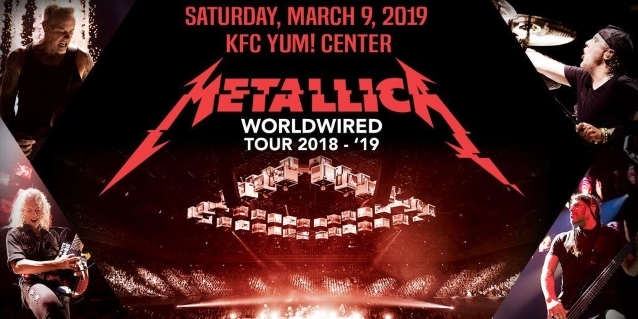 Professionally filmed video footage of METALLICA performing the song "Enter Sandman" on March 9 at Louisville, Kentucky's KFC Yum! Center can be seen below. METALLICA's concert at KFC Yum! Center shattered the venue's attendance record with a crowd of 23,084 fans on hand. The previous record was held by country legend George Strait, who drew 21,700 fans in 2014. "METALLICA was incredible from start to finish. The fans' excitement and energy could be felt throughout the arena all evening," said Eric Granger, KFC Yum! Center general manager. "We are proud to continue to work with the world's leading live entertainment companies to bring the world's largest touring acts to Louisville and grateful for the community's continued support of the KFC Yum! Center and artists who play the venue." 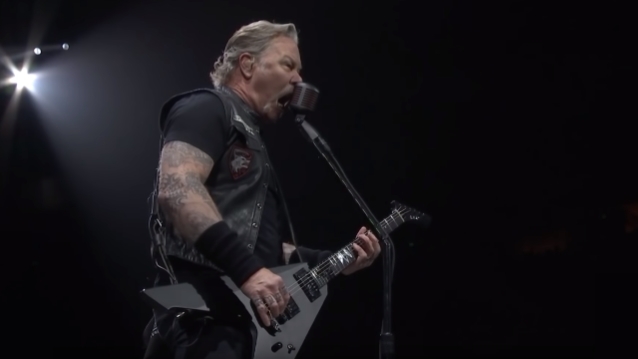 METALLICA's sold-out concert in Louisville was also the highest-selling stop on the latest leg of the band's 35-city "WorldWired" tour. METALLICA had never played at the Yum Center and hadn't played in Louisville since 2004, when it played at Freedom Hall.